winner announced for this rak! congrats to heather from michigan! her name was drawn at random today. thanks to all of you amazing poets!!! i am tickled pink with all the creative wordsmithing going on here! my new bff's (best fiskateer friends!) gave out fab gift bags at the fiska-disco party earlier this week...and i want to pay it forward. so my rak (random act of kindness) for this week is to give away a few things from my gift bag, just in time for valentine's day...a set of journal mount stickers and chippy alphas from heidi grace, and a scalloped heart-shaped squeeze punch. you know you want it - so get your name in this drawing! i will draw one name at random from comments on this post on february 4th to win. •••••all you have to do for a chance to win is leave a comment! be sure to include your email if your name doesn't link anywhere. if you want two chances to win, include a little valentine's rhyme or sentiment in your comment. and if you want three, yes three chances to win - just grab my angel collage badge over there on the right, and let me know you have it linked to my papercrafting blog carnival on your site. help me spread some linky love for all the inspirational papercrafters out there! my co-worker, megan, asked me to make a special birthday card that she could give to her boyfriend, who she is surprising with a trip to san francisco. 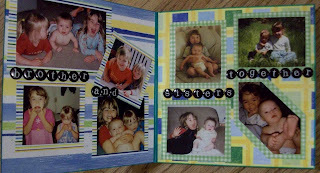 i made this card with images cut from this great postcard book by photographer thea schrack. megan seemed to really like the card, and i hope her boyfriend does too! this issue has a terrific variety of things to amuse and inspire you! • if you don't know who lauren ferguson nwachukwu is yet, you should! her altered art is some serious creative mojo. check out this papercrafted chess board she made. 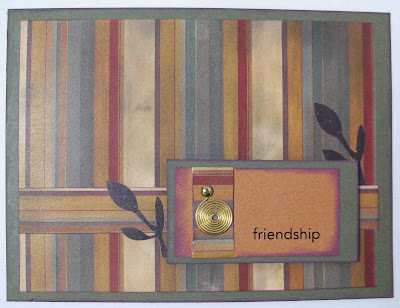 • vera lang at fine craft guild has a terrific article about 6 ways to use stamps in scrapbooking. her blog is packed with tons of how-to advice! • now this is green crafting for ya...learn how to create a super cute gift card holder from an empty toilet paper roll on the ccayr blog! 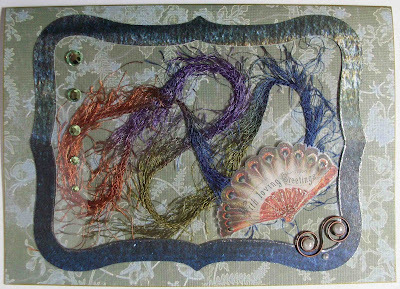 • i "met" jan on twitter - i just love how she incorporates wire, beads, ribbons and fibers into her cards...check out her valentine's day work! • today i shared a cab with lain ehmann, author of snippets: mostly true tales from the lighter side of scrapbooking. she is a writer, humorist and scrapbooker. check out her podcasts here! • spend some time on c&t publishing's flickr page for lots of pictures of blank board book designs....so much gorgeous inspiration! you can join their groups and post your own work too! that's a wrap - hope you enjoyed some good link-hopping! thanks for being here! just made friends with julie in missouri - she is offering a really fun pink and black set of papers and embellishments on her blog - check it out, you might win! check out her online store too, she has some great papers and kits. yesterday was the 20th and i drew a name at random from those of you who follow my blog...stacey from new york is the lucky winner of this sweet little handmade friendship card!! stacey is into scrapbooking, sewing and jewelry-making. congrats and thanks for following my blog! 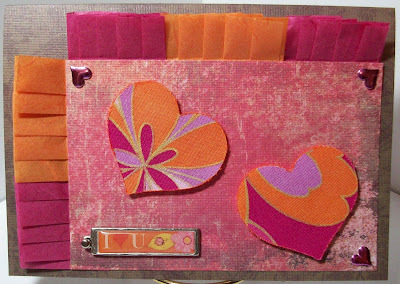 be sure to check out my cardmaking tips on squidoo - the link is down there on the right. i'm adding new content regularly, you might want to bookmark it! 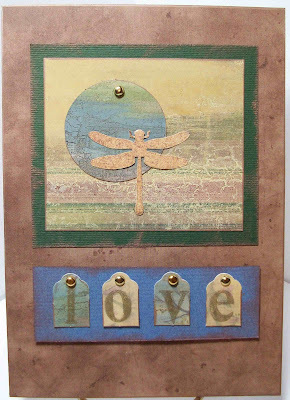 i have joined several groups on facebook for cardmakers, stampers, papercrafters. one in particular is having a card swap with a "love" theme. my swap partner is kelly in the u.k. so she and i are making a card for each other and sending it off this week. i tried something different - i diecut a frame with my cricut, then adhered a piece of transparency to make a window. behind the window i placed a squiggle of multi-colored feathery yarn. on top of the window is a "with loving greetings" vintage fan rub-on from dover, as well as some crystals, wire and pearls. i used my glitter pen to go around the edges of the frame, and added some glittery accent to the fan also. today was a birthday party for my best friend kari's daughter ryan - she turned 8. this is the little card i made for her - she doesn't like cake, so we all had birthday donuts! check out the great color challenge at scrappy hours! hot pink, orange, brown and tan were not colors I thought i could work with at first, but they turned out to be really fun! the hearts are fabric fused to fast2fuse stiff interfacing and I folded the ruffles from tissue-thin handmade paper. 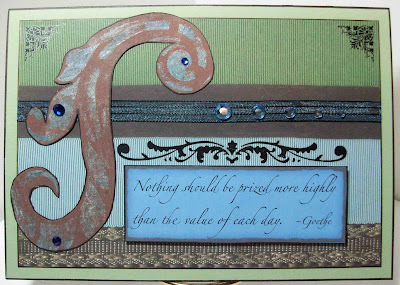 the cardstock and background paper comes from my new favorite dcwv stack "old world." but the best news is the prize - everyone needs this little gem of a color tool! so c'mon over to scrappy hours and show us whatchya got! thought i would share a card i made for my mom a while back - it was fun to make (but then i say that about all my cards). i love purple and lime green together. I also like working with translucent papers. thanks so much to everyone who visited my blog and played for a chance to win...and congrats to donna from montana! donna's name was drawn at random to win my blog candy - she will be bejewelin' soon. 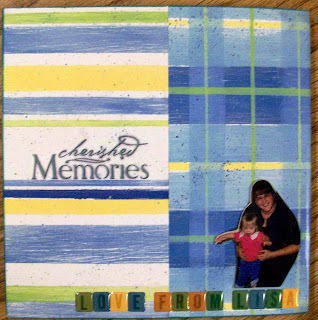 donna is a grandmother, scrapbooker, cardmaker, needlepointer ...an all-around crafter! this is a shot i took of a tree in my mom's neighborhood - gorgeous reds and oranges! be sure to enjoy my latest issue of papercrafting with lisa - tons of great links for inspiration all over the web - all in one handy post. happy new year! i'm soooo looking forward to 2009 being filled with creative papercrafting! i wanted to share a gift idea that can really help a mom out! my cousin has three kids, lots of family activity, loads of photographs of piling up in shoeboxes, and no time to do any scrapbooking. so i offered to put together a scrapbook for her that the kids could enjoy looking through together....and it would help them remember how much they really love each other whenever they were in a squabbling mood! i went to their house and pored through the boxes to select shots that best captured their special family moments. i took the pictures home and started sorting, trimming and organizing them into groups by theme. i lined all the pages of an 10x10 blank board book with a variety of colorful papers. i mod-podged the front and back covers for a little extra protection from kids' sticky fingers. i created very simply constructed layouts to get lots of pictures on each page, and to make it kid-friendly with stickers and bright colors. 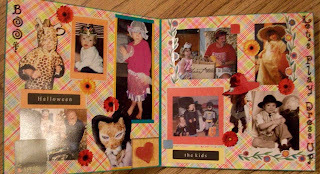 each page has a theme like halloween, dress up, christmas, playtime - it was so much fun to make and my cousin's family thought is was pretty special! ••••• these green and crafty folks submitted their posts to me - great stuff! • katie in germany recycles and reuses everything! check out her gift tags, handmade from stuff you are gonna think twice about tossing out. • the vintage info network reminds us how to make a favorite classic - the pinwheel! • lisa at condo blues makes cute danish woven paper hearts and snowflakes from her junk mail and wrapping paper. ••••• here are some posts that i have been collecting since the last issue - things that made me say "wow!" • jenn turned me on to japanese kusudama - origami paper balls that you can use for gift accents, or glue together to make a gorgeous paper ball ornament. a tutorial is at folding trees. • rubber stamping fun shows you how to make custom rub-on transfers from your hair styling products! • rosanne has a quick and smart idea for a hostess gift. • louise shows off an adorable explosion box she made for her hubs! there are great tutorials at scor-pal and at life as lou. 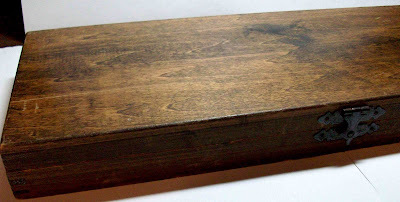 i can't wait to make my own explosion box!! 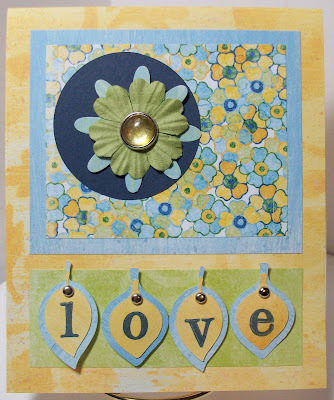 • i've been seeing lots of really cute squash books - split coast stampers has a good tutorial plus a whole gallery of samples. • debbie in new zealand shows you a sweet window scrapbook layout with folded paper that looks like curtains. • i'm in love with spinner cards! hero arts has a terrific video tutorial - such a fun way to animate your greeting! • becky in tennessee makes these very thoughtful abc baby albums for new moms! thanks so much for visiting and clicking -- my next issue will be posted on 1/24/09. feel free to share a link to this issue in your own blog - grab my badge up there on the right to post with it! time for some blog candy!! 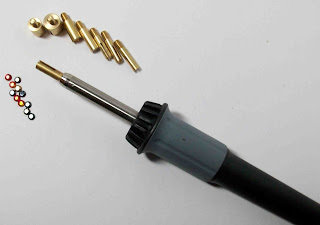 i have an ever-so-gently used heat-set jewel tool that I would like to give to a loving crafty home. it's wonderful for adhering crystals, rhinestones and metallic studs (creative crystal has a fabulous selection) to fabric, paper, all kinds of surfaces. it comes with 8 different sized tips and a few rhinestones to get you started. i got a newer tool that's a bit more ergonomic - and i will be sharing some fabulous bejeweled projects very soon! i am working with creative crystal and they have my blog listed on their ideas and inspiration page! leave a comment here if you are interested in getting this wonderful tool, and i will draw a name at random on sunday 1/11/09. be sure to include your email address (but not your mailing address) in your comment if you don't have a blog or website linked to your comment profile....so i can contact you with the good news! taking just a little break from papercrafts to try my hand at nature photography. to start, i've been taking shots around my yard and my mother's yard, just for fun...and who knows, some i like well enough to have professionally printed for cards or wall art. i don't have a fancy camera, but i'm pretty pleased with the results i get from this little kodak 8.2mp. this is the tree in our backyard - but i made it b/w and then boosted the color, i really like how scary it looks! this is a little metal fairy i got for my mom a while back. 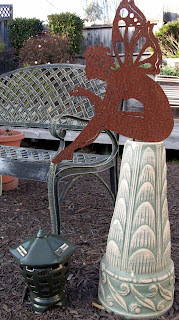 she looks cute in her backyard perch, ready to chat with whoever comes to sit on the bench. blog follower drawing - january winner!! thanks to everyone who follows my blog - i hope you enjoy the projects i post and find some inspiration to create something wonderful for yourself! as a little treat, i draw one of your names at random on the 5th of each month (maybe twice a month sometimes!) to win two of my handmade greeting cards. today's lucky winner is....sandy from montana! 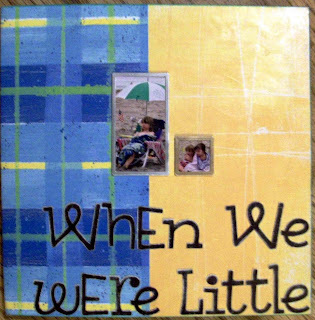 sandy is a teacher, a cardmaker and a scrapbooker - she doesn't have a public blog, but if you are a fiskateer, you have probably seen lots of her wonderful work! i will be sending her my recent goethe card and one of my earlier fantastiques cards. congrats, sandy! my next drawing will be on february 5th. if you're not following already - why dontchya click on over up there on the right and join us - you just might win! btw - i took this picture last week of tiny 1/2" white blooms with just a hint of morning dew, growing on a huge vine in my backyard. it's part of my daily photography journal for 2009 - have a look and let me know what you think! i took a bunch of photos in my mom's yard today - i'm trying to improve my photography skills by looking for artistic light, angles and detail in simple everyday things. I'm part of this terrific 365 group on flicker which is inspiring and motivating me to create a daily photo diary. i was pleased with most of the shots i took...i'm discovering that it's all about the rotating and cropping. it's amazing how a picture can change - like this cloud I saw this evening that looks like a pretty feather when i turned it sideways. 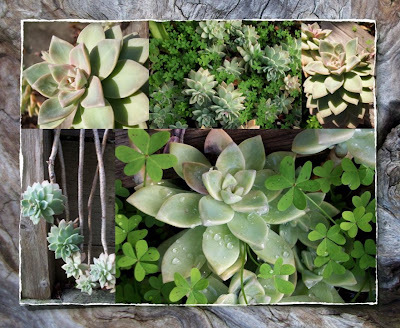 so with all these great pics, i thought i'd try my hand at a little digital collage. i don't even have photoshop, i just did this in keynote (a mac program like powerpoint, for making slide presentations). when printed out, this makes a lovely card! new card sets for sale! 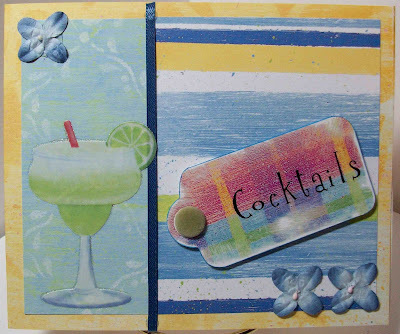 i just posted two adorable sets of 4 cards each to my etsy...love and cocktails! don'tchya just gotta have 'em? They're very reasonably priced - check it out - click here for my shop. it was just announced...i'm thrilled (or as a blogger pal in scotland said "i'm chuffed to bits!") to be on the design team for the scrappy hours challenge blog!! michelle posts great themes twice a month, you really ought to join us! 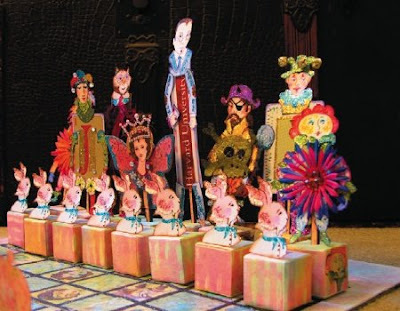 my first contribution as a dt member will be up on the 1/15 challenge....but for the current challenge, I am offering a book of Fantastiques Whimsies in a prize drawing for one of the lucky participants!! the current theme is "count your blessings." i chose a quote by johann wolfgang von goethe..."nothing should be prized more highly than the value of each day." this quote just speaks to me! i made the placard on the computer and hand trimmed the large scroll. the other black flourishes are rub-ons. i outlined all the papers in black, i like how it sets off the color. i joined this amazing group on flickr called 365....there are about 150 members and each day we all snap and post a new picture about whatever is meaningful for that day. melina, a talented scrapbooker and photographer created and moderates the group. we have some incredible talent - it's definitely bookmark-worthy!! here is my first shot...these are some of my favorite tools and supplies that i hope to wear out by the end of this year!! i played with the color saturation of the photo to make it more interesting. i am so excited about this opportunity to improve my photography skills (although my camera is not fancy), explore another creative outlet, and chronicle my year while i'm at it! not putting christmas away just yet! this month's challenge is posted at christmas cards all year 'round and here is my first card I created as a member of their design team to inspire the participants. the theme is traditional red and green, with a stamped sentiment. I'm a big fan of recycling seasonal cards after i've enjoyed them. both the poinsettia border and the candle setting are trimmed out of old cards and used again in a new way! the beauty of the CCAYR blog is the monthly prize incentive! you get in a drawing if you create 5 cards each month - which also means by next xmas you can have all your handmade cards ready to go with way less stress! so click on over to CCAYR and join in the fun - we'd love to see your cards! one powerful hour has challenged us to create a piece using one of our first crafting items we ever got. 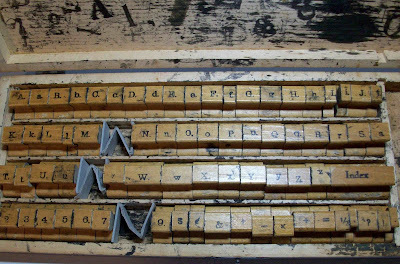 my mother gave me her vintage stamp set many years ago, she had received it as a gift when she was little. a few pieces are missing, but i love this font! i stamped "love" on little tags in gold ink, i wanted it to be really subtle. i also used one of the first techniques i learned - inking the edges of paper with either a paint marker or stamp pad. 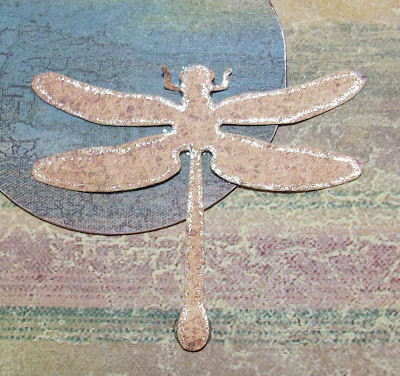 i really like these dusty colors together, and of course everything is better with a dragonfly. i outlined the dragonfly and letters with a glitter pen.